I'm into my archives for some pics since I haven't been out wandering very much. 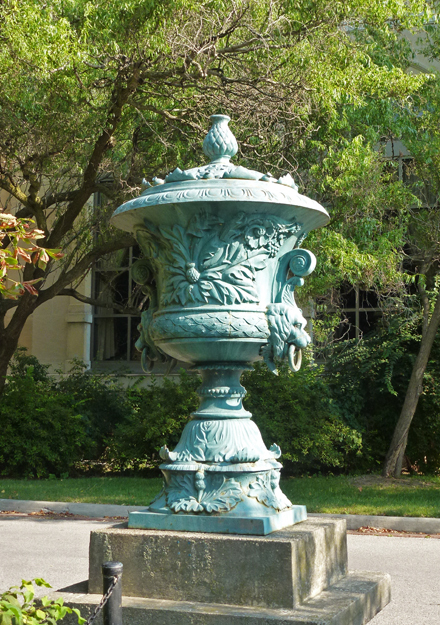 I found this beautiful urn on the grounds of Exhibition place and then I seemed to keep finding more of them as I kept walking. It reminds me of a sunny day in the autumn! Hello, it is a beautiful urn. I have not been out wandering lately, wishing for warmer weather. Happy Tuesday, enjoy your day! A little reminder of warmer weather is a good thing. It is a very beautiful urn. It's beautifully done. I've seen these around those grounds. It is very pretty and I welcome seeing such a lovely day! I hope your weather gets better! How pretty! I can't imagine how cold it must be where you are. We are getting down to 22 degrees F tonight here in north Florida, which is frigid for us! 0 degrees(f), -10 wind chill last night here in St. Louis. You have to stop sending this crazy cold down my way. More snow here today, with hazardous driving conditions so I am going to resort to archived photos too! This is a very pretty urn, in a lovely colour! I'm sure your weather is ultra cold...so why not look back to warmer times. Beautiful detail on this urn. A very beautiful urn, Pat. Yes, that urn really is beautiful. Appreciate the sunnier and warmer picture. Yes, it is large and very ornate, too. Gran escultura con buenos detalles! !